When I was a child I read a lot of fairy tales. Way too many, probably. The guiding principle in most of those stories was that truth and justice will eventually triumph over evil, that love will find a way, and that lasting happiness is achievable if you work hard enough. These are comforting ideas when you are child. Children are small to begin with, and forced to take orders from much larger beings, who are themselves compelled at times to submit to all sorts of cultural practices, many of which are a huge waste of time and emotional energy. Fortunately, the average child is resilient and resourceful, and soon enough learns either to manipulate the system or to avoid it altogether. I chose the latter route. Fiction was my hot rod Ford out of dreary convention. Of course even in fiction conventions thrive which perpetuate the system. However, authors at least have a choice to follow the rules or bend them. 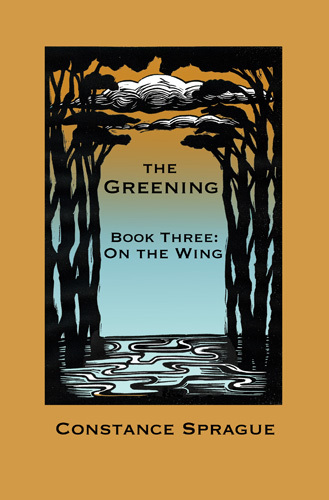 My newly released novel “On The Wing,” Book Three of The Greening trilogy, is a bender’s tale of hopes and dreams, young and middle-aged love, vengeance and heroism. In it the characters who fought and fell and got back up again in Books One and Two band together to save the world one more time. Eva Carter, who ran away from home as a teenager to find the father she never knew, finally learns the truth about Shiloh Carter’s “day job” when she returns to help her mother in the struggle to repair damage caused by destructive magic sown in the Greening. In the process, Eva reconnects with her emotionally wounded father, her haunted grandfather, and a winsome sprite with otherworldly Green connections. But when Destiny comes calling, Eva and Shiloh join forces with a ragtag crew of not quite superheroes as they head into the final battle. Sooner or later one of them will have to pay the ultimate price to save the world from going up in smoke. Happily ever after? Could happen.